This name uses Spanish naming customs: the first or paternal family name is García-Berlanga and the second or maternal family name is Martí. Luis García-Berlanga Martí (12 June 1921 – 13 November 2010) was a Spanish film director and screenwriter. When young, he decided to study philosophy, but his true calling pushed him to enter in 1947 the Institute of Cinematographic Investigations and experiences (Instituto de Investigaciones y Experiencias cinematográficas) in Madrid. In his youth he enrolled in the Blue Division in the Eastern Front of World War II to avoid his father's execution as a Republican politician. His debut as a film director in 1951 was with the film That Happy Couple in which he worked with Juan Antonio Bardem. With Bardem, he is considered to be one of Spanish film renovators after the Spanish civil war. Among his films stand out several unforgettable ones of Spanish film history, such as Welcome Mr. Marshall! or The Executioner. Bardem and he cofounded a film magazine, Objetivo, in 1953. The magazine existed until 1956. He worked on seven occasions with screenwriter Rafael Azcona. Characteristic of his films are their sense of irony and the satires of different social and political situations. During the Francoist State, his ability to outwit the censors allowed him to make daring projects such as Miracles on Thursdays. In 1968, he was head of the jury at the 18th Berlin International Film Festival. In 1986 he received the Prince of Asturias Award for Arts and in 1993 the Goya for best director for Everyone to Jail! His film Plácido was nominated in 1961 for the Academy Awards for Best Foreign Language Film, Gold Medal for Fine Art (Medalla de Oro de las Bellas Artes) in 1981, Spanish National Cinematography Prize (Premio Nacional de Cinematografía) in 1980, and has been granted with the Italian Commendatore Order. 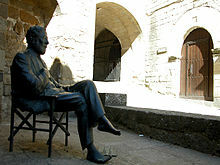 Berlanga won international prizes in the most important film festivals: Cannes Film Festival, International Film Festival of Valencia, Montreal World Film Festival, Berlin Film Festival. In the Karlovy Vary International Film Festival he won a prize as one of the world’s ten most prominent film directors. He has also been awarded a countless number of national acknowledgements. ^ "Luis Garcia Berlanga". The Daily Telegraph. London. 18 November 2010. ^ S. Marsh (15 December 2005). Popular Spanish Film Under Franco: Comedy and the Weakening of the State. Palgrave Macmillan UK. p. 207. ISBN 978-0-230-51187-3. Retrieved 4 February 2017. ^ Virginia Higginbotham (27 January 2014). Spanish Film Under Franco. University of Texas Press. p. 25. ISBN 978-0-292-76147-6. Retrieved 4 February 2017. ^ "Berlinale 1968: Juries". berlinale.de. Retrieved 1 March 2010. ^ "The 34th Academy Awards (1962) Nominees and Winners". oscars.org. Retrieved 29 October 2011. Wikimedia Commons has media related to Luis García Berlanga.